Two years ago this month our family found out my brother had lung cancer that was out into his chest, so it was inoperable. Could only be treated with radiation and other things. This made him so weak and tired, but he was a fighter. He continued to work, fish, camp and drag race. This was a man so full of life and everything he did was big shoes to fill. Him and his wife built a rustic a frame house. He could work on a car or truck or just about anything. 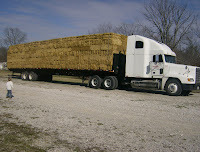 He had a hay business and drove a large truck with a heavy load. He was our boat driver and many good times we had on the lakes and camp grounds, making home made ice cream, grilling and fishing some times all night. How could this sweet loving person that would do any thing for anyone have this cancer. Why him does God not here my prayers and the prayers of so many others. I know many others have been there and feel my anger and pain. My brother was the strongest in his fight to live more than anyone I have ever seen. We spent as much time with his as we could and doing all the things we loved. He won first place just three weeks before but continued to race until he was so weak that his fellow racing buddies had to lift him out of the car. A time no one thought would ever come. This is a poem that is so true of my brother tomorrow is his birthday March 2 he would be 63 and had so much more to do and years to live. So He put his arms around you and whispered, "Come with me"
My brother lost his fight on October 16 2009 we were all with him. Now he is in Gods hands with no suffering and pain. I take comfort in knowing I will see him again But the ones left here are so lost and lonely without him. I loved him so much, these last months have been so hard and so lonely. All the cold and snow does not help, am trying to get back in to my blog and web-site. My church familey has helped me so much and with out God how could anyone get through these times and friends are needed so very much. Love your familey and friends as we never know when and how long we may have them.